The objective of the LUSU FoodBank is to eliminate student hunger at Lakehead University. Created in 1992 to provide assistance to students who find themselves in a tight spot for food, the Food Bank has grown from a strictly service based, volunteer run centre into an organization that advocates for and improves food (in)security. The FoodBank is operated and funded through Lakehead University Student Union. The LUSU Food Bank provides emergency food to students in need. From 2012 to 2013, use increased 70%. In 2014/15 the Food Bank was accessed 700 times. Between January of 2015 and December of 2017, the Food Bank was accessed more than 4,000 times, marking a consistent rise in use of emergency food services. Grocery purchases from LUSU budget and generous donations from community members have kept the shelves from going bare. Perhaps full shelves are a measure of success. Then again, closer examination begs a couple of important questions. First, does the Food Bank provide nutritious, healthful food fit to power the brains of hard-working students? And second, are we building a lasting solution by empowering students to diminish their need for emergency food services? In asking these fundamental questions, the LUSU Food Bank mirrors the shifting school of thought around food banks, hunger, and poverty that is occurring nationwide. 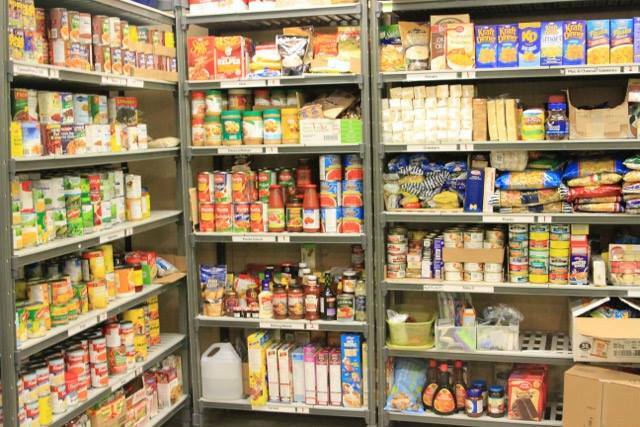 Food banks traditionally brim with high-sodium, low-nutrient, processed foods, posing an immediate barrier to food bank users trying to sustain a healthy diet. The impacts extend beyond physical health. Nick Saul, director of The Stop Community Food Centre, equates receiving unhealthful or low quality foods to being treated like “a second-class citizen.” He describes the humiliation often associated with using a food bank, saying, “to be offered bizarre processed food products or slimy, wilted lettuce that couldn’t be revived with electric shock treatment, is the final nail in the coffin” (Saul & Cutis 2013). Vulnerability does not mean a person deserves to eat low-quality food. As students, we know that a brain doesn’t work for long on a diet of mac’n’cheese. Canada’s legal framework echoes this sentiment, and affords it’s citizens the right to food. The right to food entails available, accessible, and adequate food. Adequate food must satisfy a person’s dietary needs (De Schutter 2010). Yet, the 2012 report of the United Nation’s Special Rapporteur on the Right to Food in Canada identified a wide-reaching lack of adequate food and a gap where a plan to remediate the situation should be (De Schutter 2012). 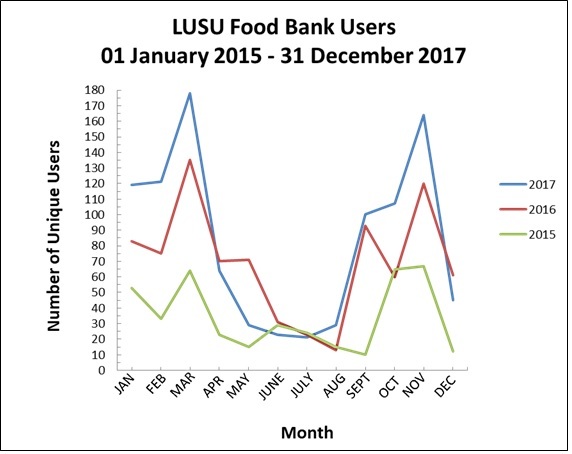 The LUSU Food Bank aims to bolster the quality of food provided to students, both for their physical health and because they deserve to eat as well as those who can afford to. Efforts thus far include buying eggs through the Outpost Campus Pub, providing fresh fruit weekly at People’s Potato free lunch, and accepting surplus goods from LUSU Sustainability Initiative Campus Markets. The Winter Greens Project provides a means to secure a year-round supply of fresh produce. Food banks were never meant to persist. First appearing in Canada in the 1980s, food banks were meant as a temporary emergency measure during recession to help people get back on their feet (Saul & Curtis 2013). Since, private and charity food aid organizations have grown ever larger, masking the enormity of hunger such that the task of addressing the underlying causes is ignored by government (De Schutter 2012). 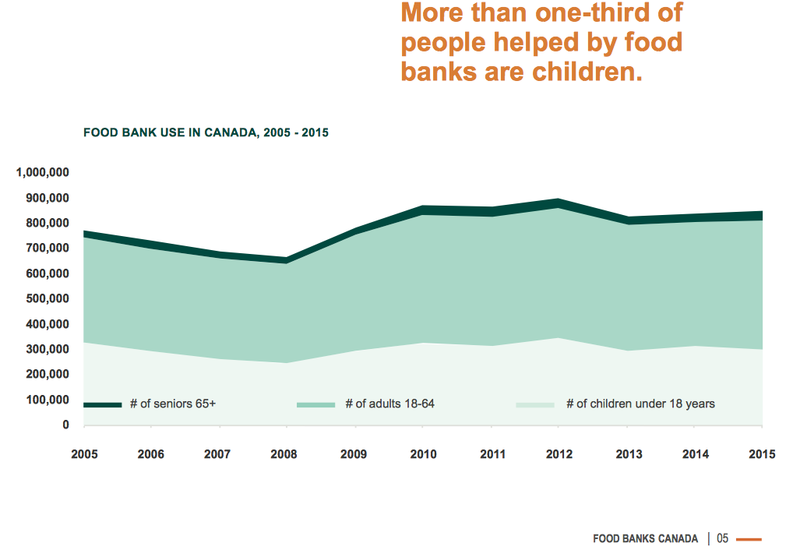 Food Banks Canada tackles the root causes of poverty and provides recommendations for change in their yearly HungerCount report on hunger and food bank use (see HungerCount 2013 for the latest statistics and recommendations). The Ontario Association of Food Banks details the Ontario findings of HungerCount and describes an alarming trend in the post-secondary demographic group. One of the largest growing groups of food bank users is students and recent graduates (Hunger Report 2013). 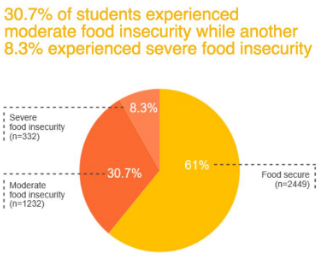 Knowing that the Lakehead student population is at high risk of experiencing food insecurity provides all the more reason to offer solutions. We believe, as Food Banks Canada asserts, that the role of a food bank is more than emergency food service. We are in a position to offer students the skills and resources to ensure their own food security. Evidence is increasingly abundant that small-scale, local agriculture effectively increases local food security (De Schutter 2010). Students with a valid student card are able to access the food bank once every month. Students with dependents (children, spouses, family members) are allowed to take double what is suggested on the shelves.